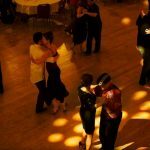 Located in the Potrero district of San Franscisco, and previously held on Tuesday evenings, this Sunday milonga is beautiful and spacious. The art deco decor is wonderful, the space is expansive and the dance floor is large. Full bar is a plus. Expect to see rotating DJs and San Francisco’s best dancers.
. Do not leave valuables in car. 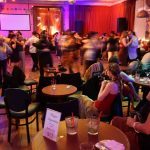 Studio Gracia is a popular and friendly milonga on Sunday night hosted by Natasha Ng. There are cozy couches, an amazing spread of food and fantastic wood dance floor. Two drop-in classes are offered: Beginner class with Natasha starts at 6:45 and intermediate class with guest instructors at 7:30pm. 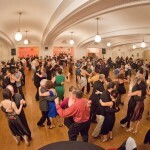 Milonga is from 8:30pm to midnight. Parking: Street parking. Please be careful in this neighborhood at night. A security guard does patrol the area and can walk people to their cars. Alberto’s in Mountain View a large dance floor, a full bar and brings in a consistent good crowd. It’s located conveniently in downtown Mountain View with a variety of restaurants and cafe’s nearby. Alberto’s often hosts guest teachers and performers, occasional live music and rotating DJ’s. Visit website for list of upcoming DJs and visiting instructors. 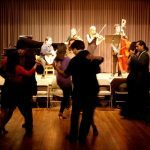 Milonga starts at 7pm. 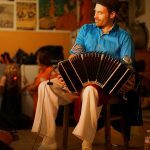 Milonga La Paz is located in room 212 of the beautiful Herbst Theater, with a view of the Opera house next door. 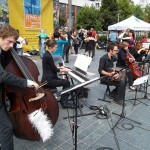 It’s hosted by Ivan Shvarts of the Golden Age Tango Academy 501c3. Chairs line the comfortable dance floor creating a relaxed atmosphere. DJs and dance instructors rotate. A very friendly and welcoming milonga. Parking: Street parking can be tricky. Civic Center Bart is nearby. 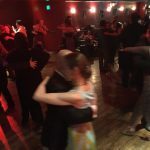 At last, a new early Sunday evening Milonga! Wonderfully decorated space with large dance floor and friendly welcoming atmosphere. 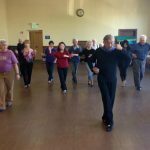 Hosted by well-known Bay Area teachers, Lisette Perelle and David Orly-Thompson, this milonga brings in a diverse crowd. Light snacks provided with gluten- free options. 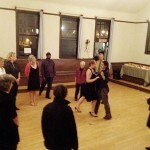 This is a once a month Milonga, held last Sunday of every month.